Middleton contains many surprises for the student of architecture. One of them lies hidden behind the walls next to the Old Boar’s head. The Old Rectory is now a fine private house that still looks across Long street to the tower and west end of the parish church, which sits on its brow with the old town tucked beneath its feet. 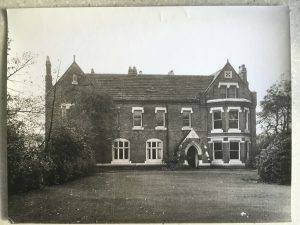 One of Middleton’s past lovers of old buildings, W John Smith, spent time in the 1960’s recording the construction of the then rundown Rectory. It was then partially demolished and rebuilt as a family home. 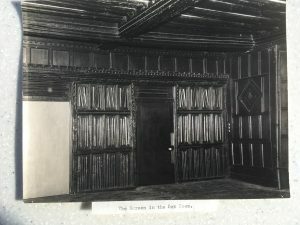 Much of the original timber frame remains encased in the brick walls however the celebrated ‘Oak Room’ remains and contains a fine example of an early ‘linen weave’ carved oak screen.